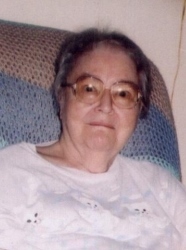 June Claudia Barton, 90 of Wilder passed away July 24, 2018. She was born October 20, 1927 in Wilder, Idaho to Alva and Winnie Barton. June attended all 12 years in Wilder school. After graduation in 1945 she moved to Boise and worked for First Security Bank for 32 ½ years. She retired in 1978 and moved back to Wilder with her mother. June enjoyed reading and crocheting. She is survived by her sister Verna (Gene) Patrick of Wilder; niece, Shari (Rod) Eggleston of Caldwell; nephew, Michael Patrick of Farmington, Utah. She was a member of the Wilder United Methodist Church. Services will be with Pastor Carole Sullivan officiating. The family would like to express their appreciation to Horizon Hospice for the loving care they provided. A Celebration of life will be at the Wilder United Methodist Church, Tuesday, July 31 at 11 a.m. Memorials may be sent to your favorite charity. Condolences may be shared with the family at www.dakanfuneralchapel.com.